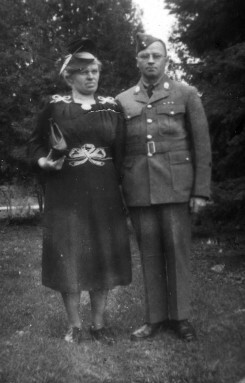 Carling West and his wife Florence. Victor Carling Gregory (Carling) West enlisted in 1916 with the 160th Battalion and served in Canada. In WW11 he was a member of the Veterans Guard of Canada and served in Canada as a guard on trains carrying Prisoners of War (POWs). One guard was stationed at each end of the coach but it is said that their guns weren't loaded. In 1955 he moved to SW 1/4 Lot 25 Concession 11 East Nissouri Township with his wife Florence. He is buried in Kintore Presbyterian Cemetery, Kintore, Ontario.